Carmarthenshire Fungi: Dendrocollybia racemosa --- another 'piggyback' fungus. Dendrocollybia racemosa --- another 'piggyback' fungus. This is like no other species I know of. Like Volvarilla surrecta Piggyback Rosegill, this grows on another fungus --- in this case Lactarius deliciosus or L deterrimus, both of which have orange 'juice'. Some books which have this species say the side branches are 'aborted caps' but they are specialised structures that produce asexual (budding) spores from their tips. 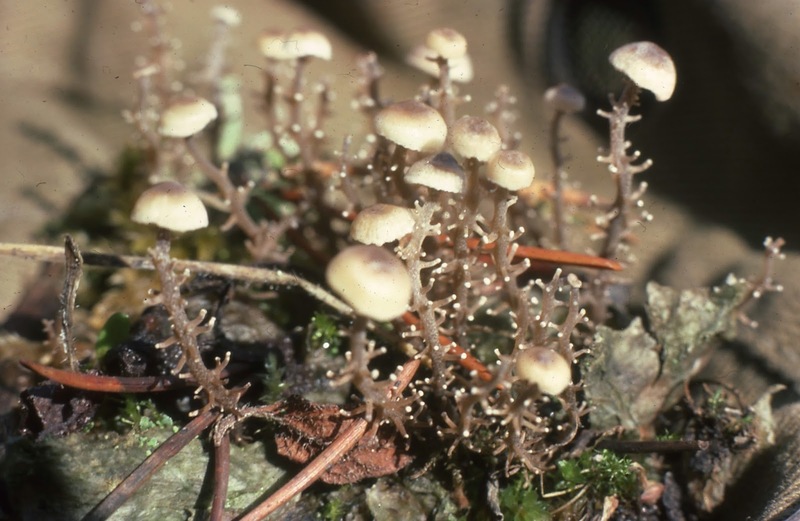 The fungus therefore has conventional spores on gills under the caps and asexual spores from the branches. Not all 'stipes' have a cap at the top as with some this is missing and replaced by the budding structure. Each stipe grows from a small 'pea-like' structure, a sclerotium, but these are not seen in the picture. This is a relatively rare species but cannot be mistaken for any other fungus. I found it at the same spot for several years at Trimsaran and then just one of these small spikes in Pembrey Forest, where the Lactarius can be found, so it is potentially wherever the Lactarius fruits ---- just keep looking!